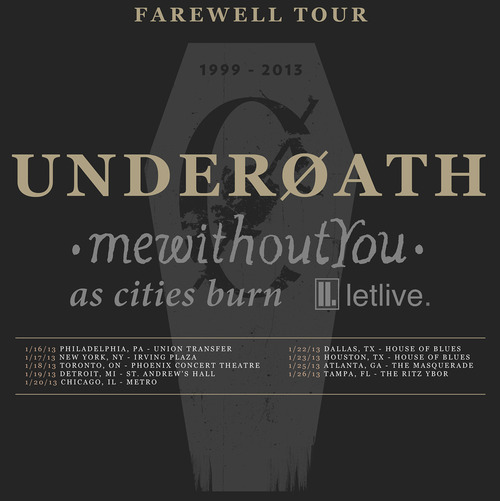 On their farewell tour, Underoath played a two night stint at The Masquerade in Atlanta, GA. I was lucky enough to catch the second night/next to last show. While having friends letlive, As Cities Burn, and Mewithoutyou help along with the tour, Underoath made this a night that Atlanta could never forget. Letlive, who was personally asked by Underoath to be on this tour, performed first to get this Atlanta crowd fired up. Lead vocalist Jason Butler was all over the stage, whether it be hanging from the ceiling or singing in the crowd. Butler’s screams and his bands instrumentals had this crowd in the palm of his hands, controlling their every move. Atlanta were definitely not strangers to letlive; they were singing the lyrics along with Jason, including one of my favorites, “Muther”. At the end of their last song, Butler grabbed one of the drum cymbals, gave a crowd member a drumstick, held the cymbal in front of the fan and let him strike it after the instrumentals had stopped. As Cities Burn played next; being on the same record label as Underoath, fans were also familiar with this band. They didn’t go as hard as letlive but they still gave this crowd a hell of a performance. This progressive rock band was anticipating Atlanta for Underoath’s arrival. With Tj Bonnette screaming and his younger brother, Cody Bonnette singing clean vocals, you could just hear how much potential ACB brought to the stage. This reunited (although they broke after the tour ended) band earned great amounts of respect for Atlanta and also myself, with it being my first time ever hearing them. Mewithyou seemed out of place on this tour but their soft-paced music allowed to the crowd to rest up before the headliner came on. Finally, Underoath made their way on stage. Chills went down my spine, anticipating their first song. Neon lights, strobe lights, and a projected video filled the stage. So much creativity filled Underoath’s stage. From crowd surfing, to slam dancing, and to mosh pits, Atlanta was delivering a show just as well as Underoath. The city holds a special place for the band, as Spencer noted during their set. They had recorded many a time at Matt Goldman Studios for their last couple of albums. While announcing that this was Underoath’s last show in Atlanta, Spencer received boos from the crowd, he then said “Boo? Don’t boo me, it’s hard enough as it is, I’m trying not to cry, I’m trying to be a man!” while he burst into laughter. With the crowd knowing all the lyrics, ranging from Underoath’s new and old songs, this show was a successful night for this band. There’s no doubt that Underoath’s frontman, Spencer Chamberlain did what he does best, impressing his fans, what he’s been doing for the last 10 years. Thank you for everything, Underoath.